BASSETT KATHLEEN Our Dearest Katie. "There are no goodbyes, Where ever you'll be, you'll be in my heart"
Love your Sisters, Brother, Mum, Spanna and families. The Funeral Service for Ms Kathleen (Katie) Bassett of Yokine, will be held in our Westminster Chapel, 502 Wanneroo Road (cnr Victoria Rd), Westminster, commencing at 1.30pm, TUESDAY (02.04.2019). The cortege will leave the Chapel at the conclusion of the Service and arrive at the main entrance of KARRAKATTA Cemetery, Railway Road, Karrakatta at 4.00pm for a Burial Service. Anyone wanting to pay their last respects is welcome to Leanne O'Dea's Westminster Chapel, at 10.00am on MONDAY (01.04.2019). Much loved member of Spencer (formerly Bristol). 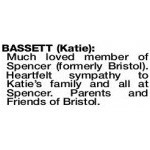 Heartfelt sympathy to Katie's family and all at Spencer. Parents and Friends of Bristol.